Come midsummer, a white-flowered Viburnum brightens the view from the dining room of the old farmhouse at Hilton Pond Center. This time of year, however, the shrub bears only green leaves--growing opposite each other on every twig. One morning this week we noticed the Viburnum's foliage had been ravaged overnight, so we went out to investigate, suspecting hungry caterpillars at work. Sure enough, beneath several petioles--about all that remained of some leaves--we found little gray insect larvae with black spots, many of which were chewing away on what leaf blades remained. "Hmmm, caterpillars," was our first thought, but on closer examination we realized they actually weren't. And that realization brings us to this week's discussion about immature insects--caterpillars, maggots, larvae, and grubs--and their differences. Those numerous larvae (above) on our Viburnum shrub did for all the world look like caterpillars and even acted like them, crawling along leaf edges with six legs (a typical characteristic of insects whether adult or immature). Several additional pairs of "prolegs"--muscular, enervated extensions of the abdomen--helped the larvae cling to their leafy perches, and it was these prolegs that told us our caterpillar-like creatures weren't really caterpillars after all. By scientific definition, caterpillars are larval stages of the Lepidoptera, an insect order that includes butterflies and moths. 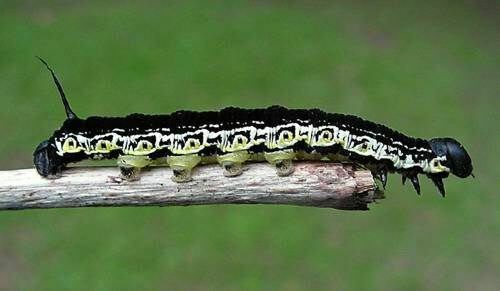 All lepidopterans undergo complete metamorphosis, the four stages being egg, larva, pupa, and adult. 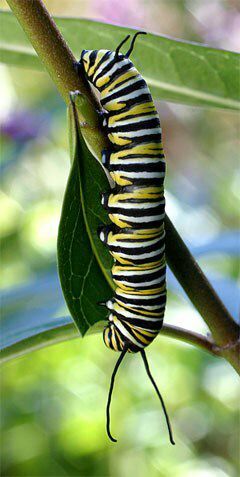 Larva go through five growth stages of their own, shedding and forming skins as they get to optimal pre-pupal size. The caterpillar in the photo just above is the final instar of the Catalpa Sphinx Moth--a larva known more famously by fisherpeople 'round these parts as the "Catawba Worm." This photo clearly shows three pairs of jointed insect legs, four pairs of prolegs, and a proleg-like "clasper" at the terminus of the abdomen. Two similar lepidopteran larvae depicted in head-down images above are those of the Oakworm Moth (left) and the familiar Monarch butterfly (right). Again we see three pairs of true legs, four pairs of prolegs, and a terminal clasper--although the latter is poorly developed in the Monarch larvae. 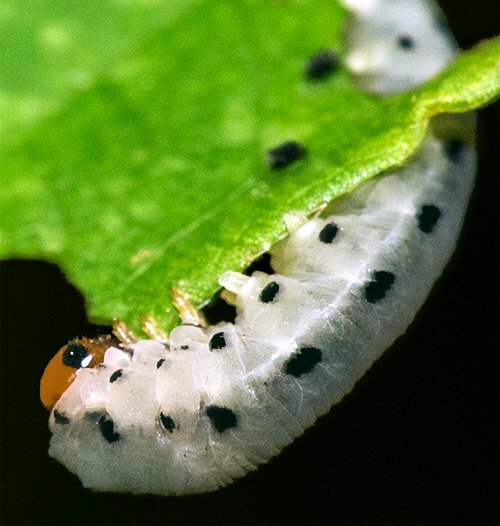 So here's the clue that told us the larvae chowing down on our Viburnum leaves would NEVER turn into scaly-winged butterflies or moths: Simply count the prolegs. Our newly found gray larvae (above) had six true legs, a clasper, and SEVEN proleg pairs--'way too many for caterpillars that have no more than four or five pairs of abdominal prolegs. Our Viburnum-eater was the larval form of an insect unrelated to lepidopterans; it was a Sawfly and a member of the Hymenoptera--the order that also includes membranous-winged wasps, bees, and ants. Adults Butternut Woolyworm Sawflies (shown mating, above, with smaller male on the left), are typical of their close kin--differentiated from many other hymenopterans by the lack of a narrowed waist between abdomen and thorax. 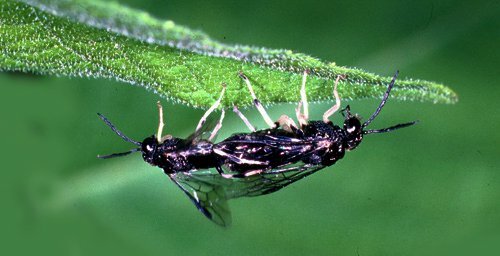 The common name "sawfly" comes from the shape of the female's ovipositor, a serrated structure with which she cuts through a host plant's tissues prior to egg-laying. When each of these eggs hatches, it yields a larva with the six or more pairs of prolegs characteristic of sawflies. Thus, the larvae of butterflies and sawflies are similar in having six true walking legs but differ in the number of pairs of prolegs. 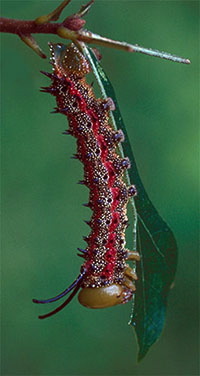 There ARE other caterpillar-like larvae that also have six true legs, but these lack any prolegs at all. 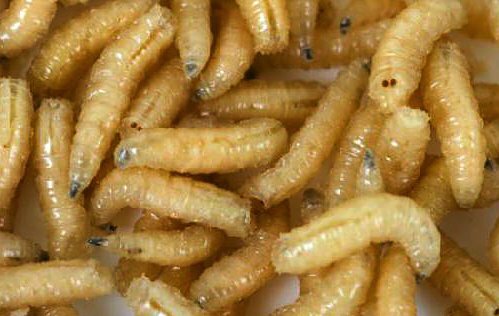 We refer here to "grubs," the common name for larvae of the Beetle Order (Coleoptera). The scarab beetle grub above does indeed have six well-developed walking legs found on insects, but its abdominal segments lack prolegs; there's also no clasper at the tip of the abdomen. 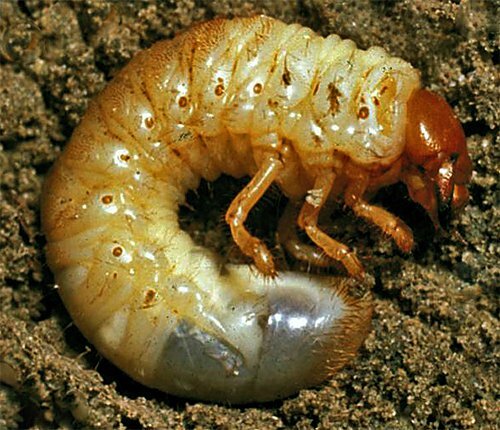 And unlike mostly freely crawling butterfly caterpillars and sawfly larvae, beetle grubs are usually found buried in soil or in dead wood or--in the case of many scarabs--feeding and growing within a decomposing deep deposit of dung. 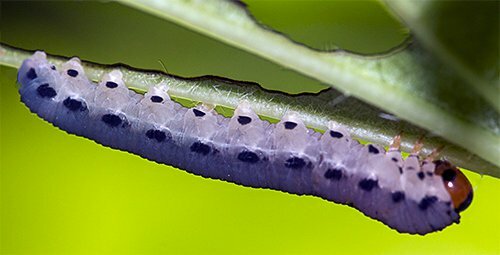 There are lots of other immature insects (dragonfly nymphs and wingless true bugs, for example), but none are likely to be mistaken for caterpillars or--now that you know the "pro-leggy" hints for identification--to be confused with sawfly larvae . . . or maggots . . . or grubs. We're pleased that folks were thinking about the work of the Center and making end-of-year contributions that were fully deductible on 2013 income tax returns. Please join them in 2014 if you can via PayPal (funding@hiltonpond.org), Network for Good, or personal check (c/o 1432 DeVinney Road, York SC 29745). The following donors sent gifts via PayPal or Network for Good, in response to a mid-May 2014 e-mail campaign for "This Week at Hilton Pond" subscribers who tell us they appreciate our on-line photo essays. Half are "old friends" who have provided support before. Some e-mail campaign respondees chose to use good old fashioned U.S. mail. It works for us, and the Center is not assessed a processing fee! 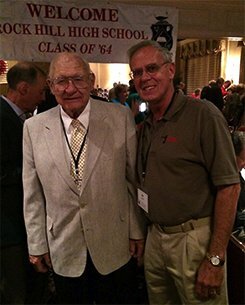 It was great to see fellow alumni this month at the 50th Reunion of the Class of 1964 from Rock Hill (SC) High School, but the highlight for me came when for the first time in five decades I got to chat with 90-year-old Joe Gault, my 12th grade physics instructor. Through his encouragement I conducted an award-winning senior science investigation of "Relationships Between Densities and Viscosities of Various Liquids"--a project that the summer after graduation sent me as one of South Carolina's two delegates to the prestigious National Youth Science Camp in West Virginia. Those three weeks in the mountains of Pocahontas County forever changed my life, led me into a career in science education, and cemented my lifelong affection for the Mountain State. Thanks a million, Joe. I owe you big time! 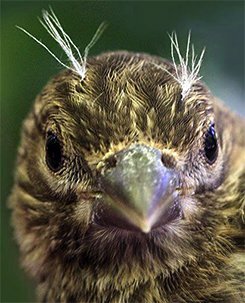 --Recently fledged House Finches (above) are beginning to assemble in increasingly greater numbers at Hilton Pond Center's sunflower seed feeders. Of the 13 captured during the period (see list at left), we were pleased to see none of them showed signs of the highly contagious conjunctivitis eye disease that in past years has affected many of our local HOFI--especially immatures. 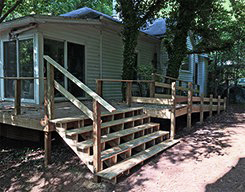 --The expanded Teaching, Learning & Observation Deck behind the old farmhouse at Hilton Pond Center is finally complete, handicapped-accessible, and available for use by student groups, home schoolers, garden clubs, nature societies, and the like during Guided Field Trips. To schedule an appointment-only field trip for this summer or fall (or thereafter), see details at FIELD TRIPS. 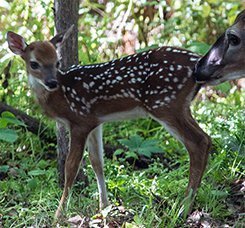 --A White-tailed Deer fawn--perhaps the same one spooked whike we were mowing trails on 7 May--was up and about on 16 May in the yard behind our old farmhouse at the Center, nuzzled onward by its mother (above). 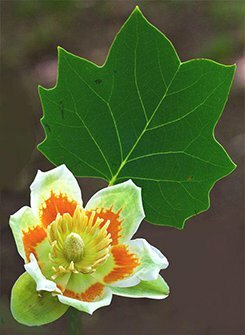 --One reason Ruby-throated Hummingbirds might neglect feeders in early May is because Tulip Trees (AKA Yellow Poplar, above) are in full bloom and hummers are foraging in the treetops. On 19 May around Hilton Pond we saw a male and a female RTHU taking nectar at least 60 feet overhead. --Pea- to marble-sized hail on 23 May beat up the foliage on our deciduous trees at the Center, adding to leaf damage already inflicted by countless spring caterpillars (and sawfly larvae). 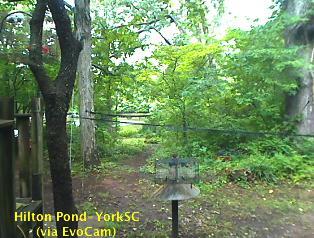 --As of 31 May the Center's 2014 Yard List stands at 59--about 35% of the 171 avian species encountered locally since 1982. New birds seen for the year during the current period: Great Crested Flycatcher. 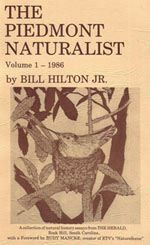 --The immediate past installment of "This Week at Hilton Pond" was a portfolio of bird & wildflower photos from South Carolina & West Virginia. The write-up is archived and always available on the Center's Web site as Installment #597.